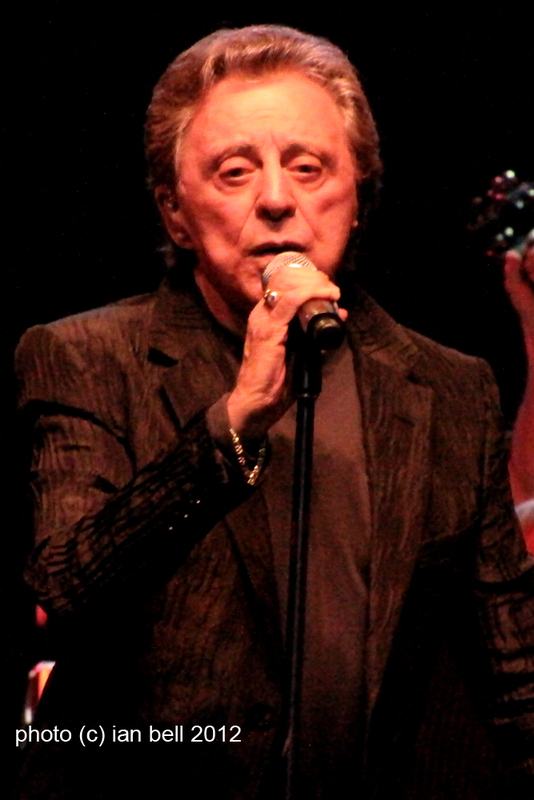 The last time Frankie Valli was in Adelaide was 1979, that's a long time between drinks and last night his South Australian fans were thirsty for the original Jersey Boy. Possessing one of the most unique falsetto voices in music history Frankie Valli was an American Italian kid, who had a massive string of 39 Top 40 Hits spanning the 1960's through the 1980's. Many of those songs still turn up in movie soundtracks and so forth a full 50 years after first being hits. 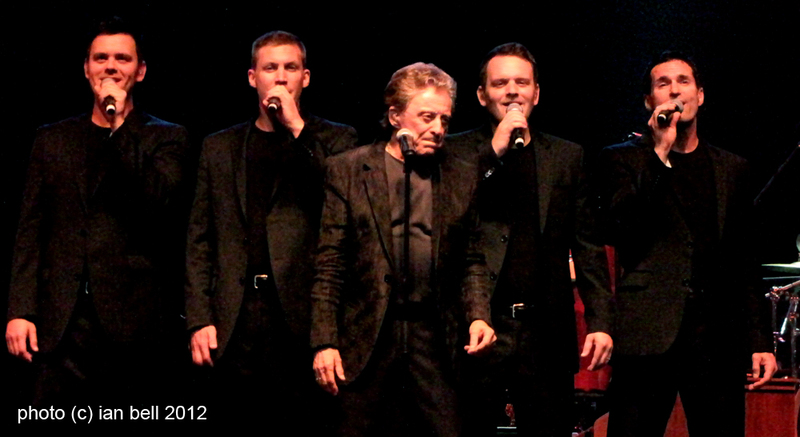 In recent years massive new interest has been generated in Valli's music via the massive success of the Jersey Boys stage musical. So there are several generations of fans at the Entertainment Centre this evening and a lot of great songs to get through. It's a big band, many of which have been with Valli for decades with a great all-Adelaide horn section (hats off guys, great job). I'm not quite sure why it was billed as Frankie Valli and the Four Seasons though. There are four young singer/dancers providing the harmonies and the choreography, but none of them old enough to be members of any of the classic line-up's of the actual Four Seasons. In fact, they were much more 'Jersey Boys' musical theatre than Seasons, to the point where I found their enthusiastic twirling a little distracting at times. They open with The Night with the local brass section earning their pay packet right up front. Dawn (Go Away) is next and their are chills up our collective spines as those glorious layered harmonies wash over us. However it certainly does appear that while Mr Valli is still quite the showman, both he and his backing singers have more than a little vocal help via what I like to call the Morning Television effect. You know on The Circle when they have a guest chef on and he's saying you have to cook the flan for 45 minutes, BUT here's one I prepared earlier? It's like that except instead of a flan it is a note perfect vocal track. A few songs in it becomes obvious that not everything coming out of the speakers is coming out of the mouths on the stage live. This is very common place these days and major acts, especially those either doing lots of dancing (i.e. Madonna, Janet Jackson, etc) or older performers who at 60 or 70 don't have the puff to put on the same show they once did, will often have a little help (and sometimes a lot) on the tape. This is always a controversial thing to say, because the people who went and had a great time feel like you're telling them Santa Claus isn't real or something. I don't think in the scheme of thing anybody in attendance tonight was that bothered one way or the other, but it needed to be mentioned. It's also important to say this was not the case for the entire performance, as something's were absolutely sung live. Opus 17, Working My Way Back To You and their classic take of I've Got You Under My Skin (dedicated to Frank Sinatra) have people chair dancing enthusiastically. The run of hits continues with Save it for Me and the excellent Beggin'. Frankie sits on a stool for one of my favourite solo Valli numbers My Eyes Adored You from 1975 (I think I had it on the Ripper compilation album!). Swearing to God from the same year, is the first of his disco flavoured hits. 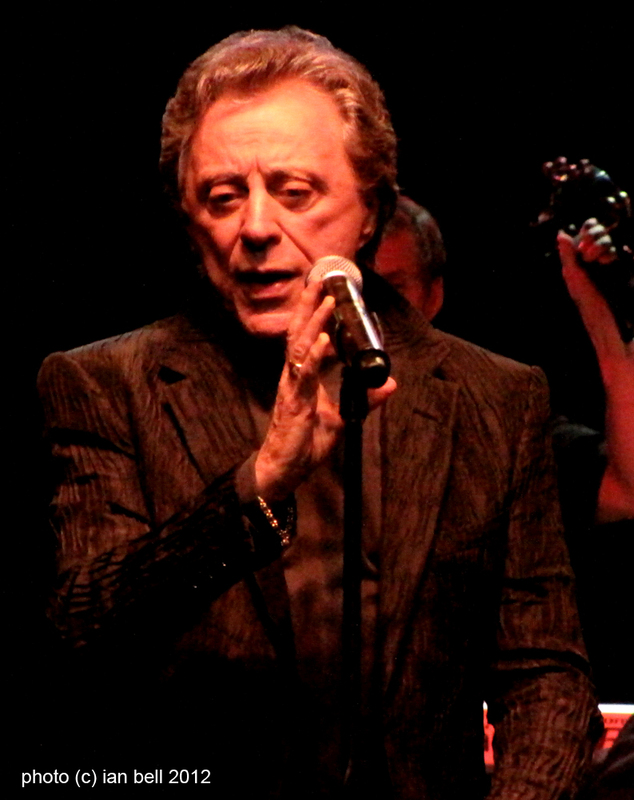 There is a section of songs from his latest album Romancing the 60's (which actually came out in 2007), where he covered a bunch of classic 60's tunes by Petula Clarke, Ben E King, Everly Brothers and the Temptations, but gave them a terrific 4 Seasons make over. So we get Call Me, Let it Be Me, Spanish Harlem and a great medley of My Girl and Groovin'. But time's getting on and there are a lot of his own hits to get to yet. And the rest of the set is 100% solid gold classics. Silence is Golden, Grease, Who Loves You. A mass sing-a-long on December 1963 (Oh What a Night) is fantastic fun, and with the four singers and Valli all taking turns at lead vocals proof that some bits of the performance are live. After introducing the band the room is full of sighs as he starts Can't Take My Eyes Off You. How many countless people have I seen dance to this song at their weddings? And that is the real point of tonight, wether or not everything is live or not, these songs have been an important part of the soundtrack of peoples lives for FIVE decades, and we are all thrilled to be in same room as the guy who made these songs so important to us. Surely that must be all the hits? No way Jose. Sherry, Walk Like a Man, Big Girls Don't Cry and Bye Bye Baby round out the evening. He returns for Rag Doll and it's during the last song Let's Hang On that there can be no doubt he has some vocal help. Bent over signing autographs and shaking hands for most of the song, his voice doesn't falter at all. And I doubt that not one of the dozens of people who rushed to the front to shake this legends hand cared a jot.